Remember those photos from that fun four-year-old? 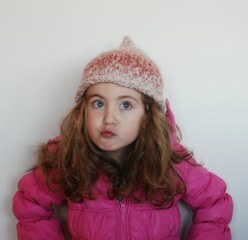 I would like to introduce Kallee in her hat that her mother commissioned for me to do! Joy, Kallee’s mom, took these photos and sent them on to me. The last one, Kallee specifically mentioned that her mother should “Send this one to Jenn.” I’m so glad she did! I love the goofy face. 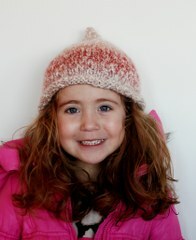 As for the project details, it’s the Sunrise Hat from Lion Brand Yarns, knit in Lion Brand Yarns Homespun in Parfait. 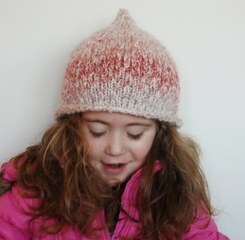 It’s a great pixie hat, and it was fun to knit. I especially love the little point on the top. How cute! 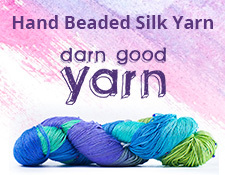 I really love that yarn/pattern combination.